Most impressive and remarkable hoverboard is finally revealed to startle you. What you are going to see is nothing less than a treat for hoverboard lovers. Zapata Racing, Franky Zapata‘s company that also created the original water-powered Flyboard, has created this amazing Flyboard Air. 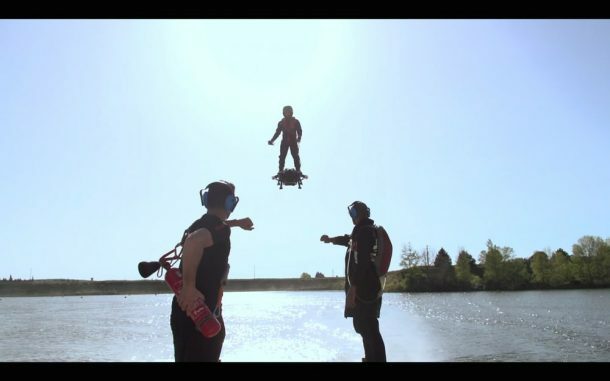 This hoverboard doesn’t use powerful jets of water to keep you aloft. It has handling and control system without having any hose or water jet to propel. Instead, the jets are replaced with at least one jet turbine engine and a backpack as a fuel tank. The company claims that this amazing board can reach an altitude of 10,000 feet. To give you an inkling of the estimate, this is more than three times the height of the Burj Khalifa, the tallest building in the world. The company also claims that the board can hit speeds of 93.2 mph and fly for about 10 minutes in one fuel tank only. 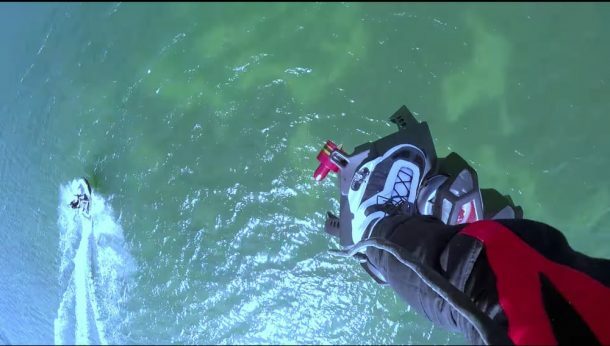 In the test shown in the video, the device flew at 35 mph for 4 minutes at altitudes far below 10,000 feet. This has raised a lot of suspicion among the people regarding the company’s claims. 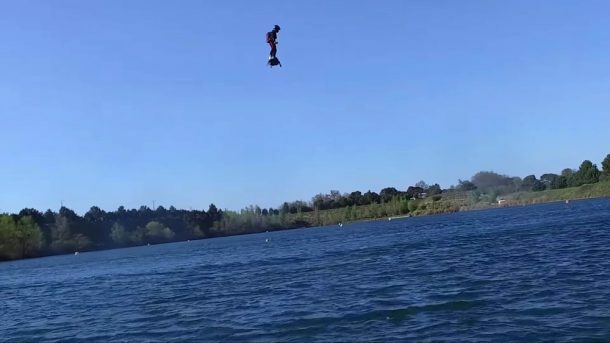 According to the company’s website, the Flyboard Air is still a prototype, even after the development of 4 years. Hence, it will not be available for sale this year. Many other things are also under wraps, such as the exact date of release, price, and complete mechanism. This is not ‘one of its kind’ product in terms of concept. Lexus and Arx Pax have also created hover boards using magnets to hover above metallic surfaces. Arca Space Corporation also created a larger unit powered by high-speed fans. However, the Flyboard Air would be an astounding prospect if its performance and capability claims prove to be true. Have any comments on the “genuineness” or “falseness” of the concept? Let ’em rip in the comments’ section below!